It’s been a L-O-O-O-N-G time since I wrote about what’s going on here that isn’t knitting. So, this isn’t knitting. This is blue ice and unless you aren’t from around these parts, you already know where this is. You’re looking at the Big Mac in the background. Mighty Mac. 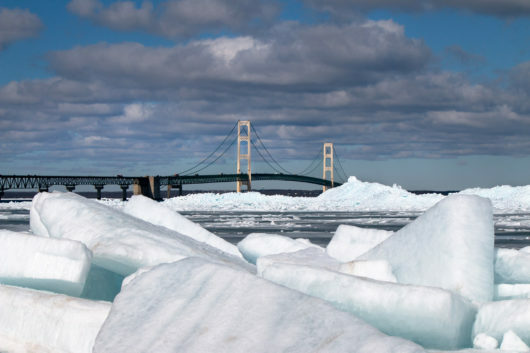 One of the distinctive things about Michigan is that we’re two peninsulas linked, since 1957, by the Mackinac Bridge. So, we’re not all mitten. Our suspension bridge, nearly 5 miles long, links our upper and our lower peninsulas. Our state motto “Si quaeris peninsulam amoenam circumspice” (“if you seek a pleasant peninsula, look about you”) should probably have been written in the plural. 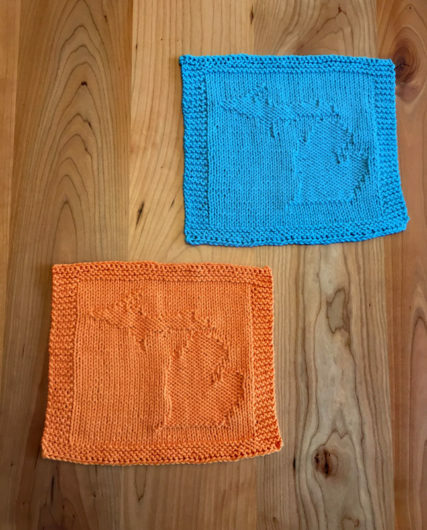 This is Carolyn Watts’ freebie Michigan Dish Cloth, knit in Knitpicks Dishie. The key to these knitted picture cloths is to knit at a tighter gauge than usual. Mine were knit on size 6 US (the blue one) and size 5 US (the orange). You’ll just have to imagine Big Mac on the cloth, though. I was tempted to add it. There’s no little gnome warming his toes at a blue hearth down under the ice shelf. 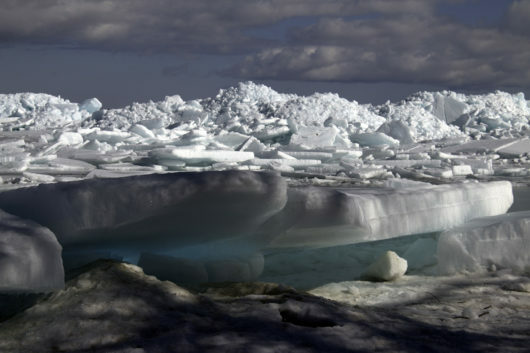 Michigan ice (OK, ice elsewhere too) can be blue. At times. Some of our Great Lake ice forms slowly on calm clear water. It won’t have many air bubbles or a bunch of crud in it. So, Pure Michigan can indeed be pure. Ice formed slowly and purely will allow light to penetrate it more deeply. The result is that longer wavelength light is absorbed and shorter blue wavelengths pass through. And our eyes see the blue. Blue ice shows up, every once in a blue moon, mostly in February or March. This was March, 2018. Ice also had something to do with this: a 22 degree Sun Halo. 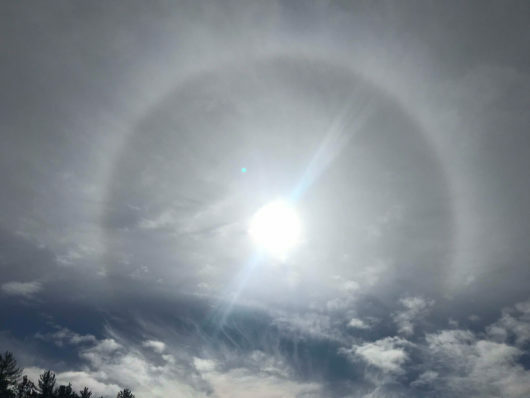 It appeared over Long Lake in mid-February, 2019. This is not some kind of lens flare. This is what eyeballs could clearly see. It’s an ice crystal halo that forms in a ring around the sun, with a radius of 22 degrees. The optics of it are beyond my understanding. The beauty of it, well I get that. Scientists say that these sun halos are an unreliable sign of bad weather to come. That, I take it, probably means that a lot of people think that these halos are a sign of bad weather to come. And that was true in our case. We had a weird week of weather that week. Snow, rain, wintry mix, sleet. But it’s spring now in Michigan. That means we will have…snow, rain, wintry mix, sleet. But there will be some sun too. Spring is bringing out the critters. This guy is digging for sunflower seeds under our bird feeder. Since some birds like to sit at the feeders and throw seeds to their brethren below, there will be seeds under the feeder. (Goldfinches you know I mean you.) 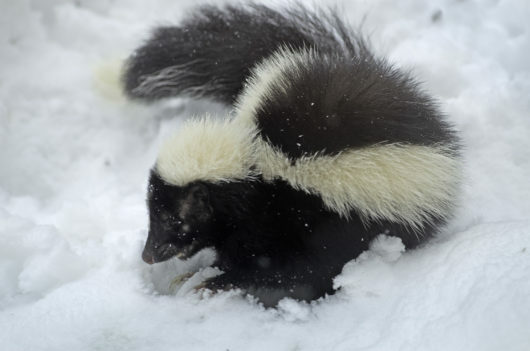 Stay calm skunk. You are too close to the house to be startled. I didn’t even want Steve to take a photo of this one for fear skunkie would startle. 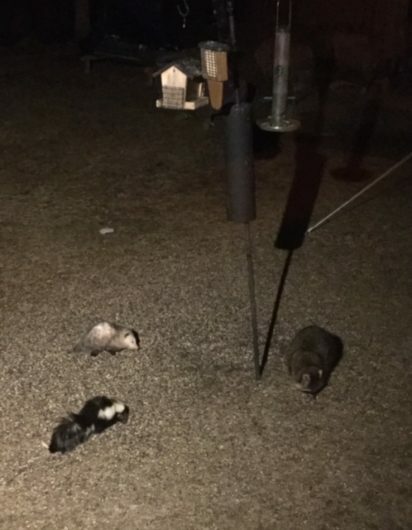 I never got a close look at a skunk’s face before. And I hope never to see one again without the protection of double-pane glass. This entry was posted in Knitting, Long Lake creatures, Michigan's "Up North" and tagged 22 Degree Halo, Blue Ice in Michigan, Carolyn Watts, Michigan Dishcloth, Photos by Steve Thorpe, Skunk, Sun Halo by Noreen. Bookmark the permalink. @Kathy…thanks! Thanks also for visiting my blog and leaving a commment.